Michelle Charter and Conrad Roy were two adolescents who met during a holiday and became friends. They continued a long distance “texting relationship” for 2 years. He suffered from depression and she from eating disorders. On July 12th, 2014 Conrad committed suicide at the age of 18. Carter was convicted by a judge of involuntary manslaughter, who stated this was due specifically to a final phone call in which, according to Carter’s own later text to a friend, she had told Roy to get back in his truck when he became scared. The grand jury found enough to charge her with “wantonly and recklessly” assisting the suicide. The case is popularly known as the “texting suicide case”. Click here for more information. When I read this information, I wondered, how Conrad and Michelle’s Mercury were connected. The relationship is not immediately visible, but what I found out, is rather subtle and as malicious as one should guess. All charts are calculated for noon. 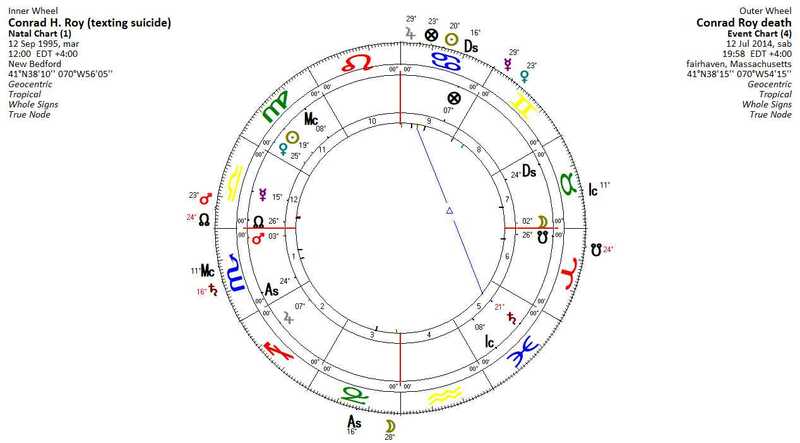 Conrad’s Mercury in Libra (inner wheel) is in aversion to Michelle’s Mercury in Virgo: They cannot “see” each other. Michelle’s Mars is in his fall and thus extremely malefic. He is opposed her Jupiter, also in his fall. Both planets are linked to Conrad’s Mercury by a T-square, where Mercury appears to be the arrow. Mars and Jupiter, two bullies encircling their victim, creating a difficult bond of emotional violence (Mars in Cancer) whispering Conrad all kinds of suicide possibilities on the one side and perhaps the illusion of some kind of recognition or the possibility overcoming (physical) limits on the other side (Jupiter in fall). Interestingly, her Mercury is in applying conjunction to his Sun/Saturn opposition. The Sun generally describes the “life light”, which in his case, has problems to shine through. That’s his depression, he has difficulties to define who he is and which are his boundaries (Saturn in Pisces), this feels sometimes like not having a skeleton or like an octopus who still has to learn to trust in the currents. That’s where her messages could crack him: his self-confidence. 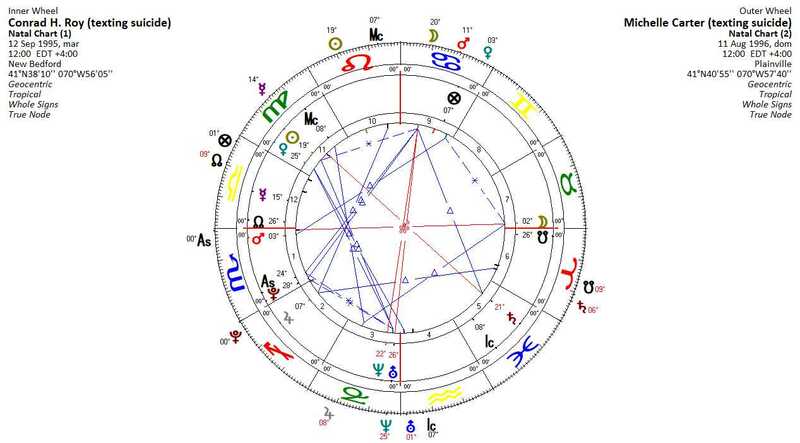 His natal Moon/Mars opposition was not afraid of violent feelings, especially those directed to himself (Sun-Saturn). He felt worth nothing and she just had to insist on that. But there is more, on a rather subtle level. The antiscium of Michelle’s Mercury at 14°41 Virgo is at 15°19’ Aries. Antiscia are “mirror points”, they happen in signs of equal ascension and thus have equal distance from the solstice. Conjunctions of any planet with a given planet’s antiscium are treated as a sextile or a trine of the planet which they represent. Conrad has not planet in tight conjunction in Aries. But now look at its contra-Antiscium (opposition to the antiscium) which is at 15°19 Libra, exactly conjunct Conrad’s Mercury! Contra-Antisciums are considered as “dark” points, of the nature of a square or opposition to the planet they represent. They describe some harming and hidden relationship. In other words, the contra-Antscium of Michelle’s Mercury is exactly conjunct Conrad’s Mercury. This means that the dark side of her verbal/written output afflicts his Mercury (ideas, info gathering, brain, learning). Now let’s have a look at the moment of Conrad’s death who committed suicide by poisoning himself with carbon monoxide fumes in his truck, while he was speaking to Michelle on the phone. We know when the call started, and when it ended and that the battery was empty, when he was found. The call started at 7.12 p.m and ended at 7.58. At that time, he was already dead. So I will use that time in order to look for connections. On the day Conrad dies, transiting detrimental Mars was crossing Conrad’s Mercury. The conjunction is separative, he had already made several attempts to kill himself. Transiting Mercury just left transiting Venus (communication with women), which also squares his natal Saturn. The dispositor of Michelle’s Mars (Moon) brought him death while she was in his exaltation, squaring his natal Mercury and transiting Mars. He died in the last minutes of the Moon being in Mars’ exaltation while in exact opposition to an exalted Jupiter. A sad example of the power of words. Firmicus Maternus gives an example in which the Antiscium of the Sun in a native’s chart represented his exile.